On June 22nd, 2009 a severe evening thunderstorm set off tornado warnings in Larimer and Weld Counties. A tornado touched down four miles west of Pierce and tornado sirens went off in Nunn an hour later. Four inches of rain fell in Laporte, 3 inches in northern Fort Collins, and over 2 in Wellington. That storm system hit Jay and Robin Davis’ home near Nunn at the base of Antelope Hill about 9pm, near where Powertech Uranium hopes to operate an in situ leach uranium mine. Ms. Davis suspected what they could only hear, the wind sounding like a train running by their place, that a tornado system had come close to their home. 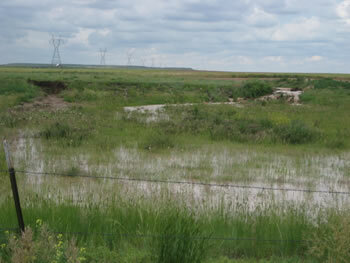 While Davis’ rain gauge showed .91 inch of rain fell there, runoff from Antelope Hill still flooded their property, over filled their pond, and washed southeastward across Weld County Road 21, an event that they frequently witness following heavy rain and snow storms. It wasn’t until 1PM the following day Robin had an idea of how much water had come off of Antelope Hill and the surrounding areas filling an intermittent stream called Coalbank Creek. Fifteen hours after the thunderstorm, dry Coalbank Creek was still moving floodwater and making many Weld County roads in the area impassible. Flattened vegetation and debris deposits showed how high the water levels had been on Coalbank Creek during the storm aftermath. Flattened vegetation is evidence of higher waters, which occurred during the night of June 22nd in Coalbank Creek. 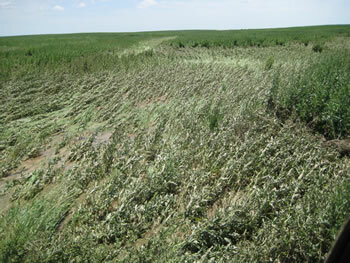 This photo was taken the afternoon of June 23 on the western side of Antelope Hill at Weld County Road 106. 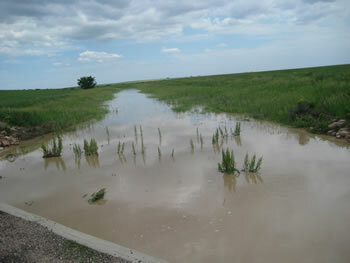 Coalbank Creek as it runs across CR106. 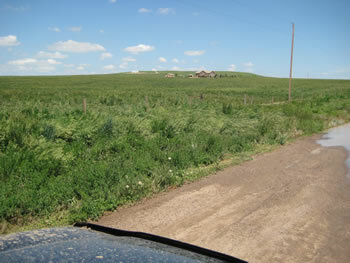 Antelope Hill is the higher area behind the residence in the center of the photo. Powertech’s while metal building can be seen mid-left in this photo on the ridge. Coalbank Creek before it crosses under Weld County Road 102 just north of CR19. Debris on the bank show the water had been running at a depth that would have covered the head of the individual in the photo. 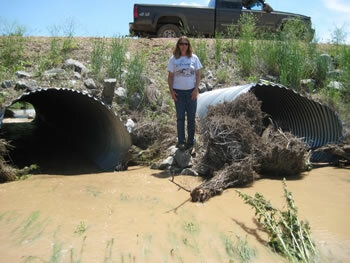 Two of three culverts under CR 102 designed to allow floodwaters from Coalbank Creek to flow under the road. 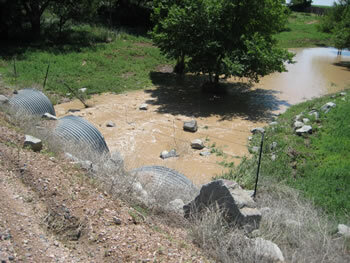 The three culverts under CR102 moving June 22nd storm waters south. Storm waters running in Coalbank Creek just before it passes under the Nunn Road (Weld County Road 100). The mesa on the horizon is Antelope Hill where Powertech proposes to do in situ leach mining for uranium. This photo was taken at 3pm June 23rd, 1009. Runoff is from a storm that passed through the area approximately 9pm June 22nd, 2009. 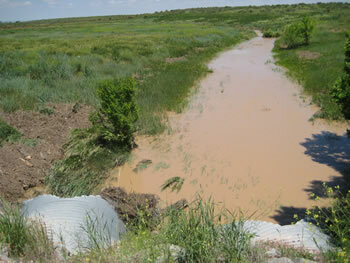 The ditch on the left shows that water levels had been much higher during the storm. Coalbank Creek on the south side of Weld County Road 100 (Nunn Road) heading southeast. This creek is an intermittent stream filling only during seasonal runoff. This water has come from and through the area Powertech proposes to do uranium mining. 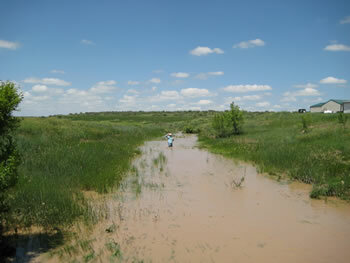 The Coalbank Creek it part of the South Platte River Basin system.